FEAST your eyes on the new Mercedes-Benz C-Class. There is more than a hint of styling cues from its bigger S-Class brother, and this fourth generation compact sedan is forecast to reach our shores late 2014. Mercedes-Benz promises weight savings of about 100 kilograms, along with improved aerodynamics and new, economical engines. With an 80-millimetre increase in the wheelbase (2840 millimetres) compared with the previous model, the vehicle is 95 millimetres longer (4686 millimetres) and 40 millimetres wider (1810 millimetres). That helps deliver improved rear seat space. The new C-Class also outstrips its predecessor in terms of boot capacity, at 480 litres. Buyers can between a traditional chromed grille with hood ornament or the more contemporary avantgarde style with the three-pointed star featured prominently within the grille. Following the footsteps of other offerings within the latest range, the C-Class will have a more youthful appeal with a range of infotainment and multimedia features along with modern interior finishes. Among the options will be a high-end Burmester audio. Among the big changes are the movement of the gear shifter to a steering wheel mounted stalk, while the dreadful foot-operated park brake has thankfully been banished in place of an electronic function. Early indications are that engines will include a C180 turbo 115kW/250Nm 1.6-litre four-cylinder petrol, promising 0-100kmh in 8.2 seconds fuel economy of 5.0L/100km. The C200 is forecast to feature a 135kW/300Nm turbo 2.0-litre four-cylinder petrol with official 0-100kmh of 7.5 seconds and 5.3L/100km economy. The C220 Bluetec is powered by a 125kW/400Nm 2.1-litre four-cylinder turbo diesel, which achieves 0-100km in 8.1 seconds and 4.0L/100km economy. Transmission choices for the launch models are a six-speed manual and seven-speed automatic. 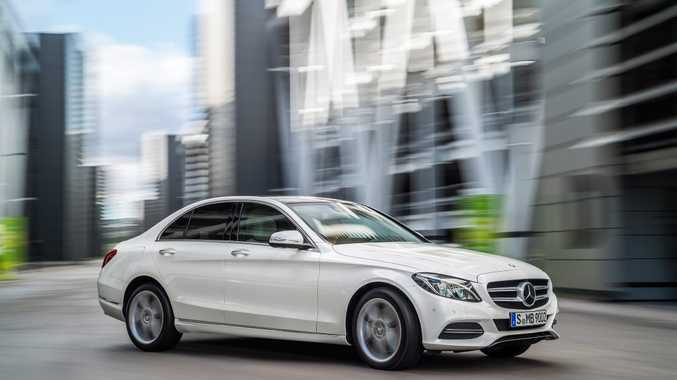 The C-Class is the biggest-selling model series from Mercedes-Benz. Sales of the preceding model, which was launched in 2007, total more than 2.4 million worldwide. We can expect four more body styles to follow in the C-Class family, including a wagon, an all-new five-door liftback, coupe and cabriolet.